Topics: Executive Committee, Scholarship Info, By Laws, Presentation Materials, and Beginners "how To". Age: It went live on July 24th 1998, making it over 19 years, 8 months old. It is hosted by American Registry For Internet Numbers (Virginia, Chantilly,) using Apache web server. 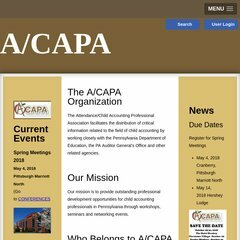 Acapa.org's IP address is 69.89.31.246. There are 2 Nameservers, ns2.bluehost.com, and ns1.bluehost.com.